Gujarat HSC Science Exam 2016 will be conducting in the month of March- April 2016. 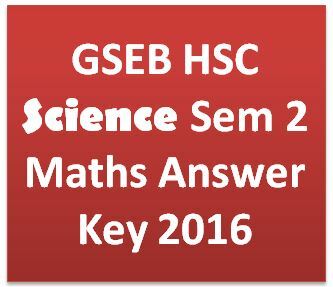 Students who are appearing for Gujarat HSC Exam are requested to check the Gujarat Board official website for GSEB HSC Science Sem-2 Maths Answer Key 01-04-2016. Paper nu level kevu hatu ?? Give me maths answers key pls ……..
when is English medium’s answer key of maths going to be updated?